This is the first application of the Indonesia postcode for the iPhone. 1. 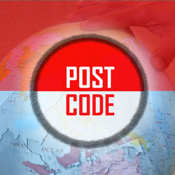 You can easily find the post code throughout Indonesia.There are two search methods are based on the address and based on post code (No Internet Connection required). 2. Shows a map of the location on GoogleMap. Ini adalah aplikasi kode pos indonesia pertama untuk iPhone. 2. Dapat menampilkan peta lokasi pada GoogleMap. Bagian ini membutuhkan koneksi internet.